After the initial breakdown, it's now time for a more detailed analysis of last night's match between Bayer Leverkusen and Benfica. Indeed, there are some curious (and revealing) facts about the performance of both teams. Interceptions made by both sides. Let's start off with both teams' interceptions. As stated in the previous article, the two teams seemed to switch roles to perfection. Because Benfica handed Bayer Leverkusen the initiative, the German team were much less effective when it came to defending. Used to sit back and pounce on the break, Bayer Leverkusen were often caught off-guard after giving the ball away. 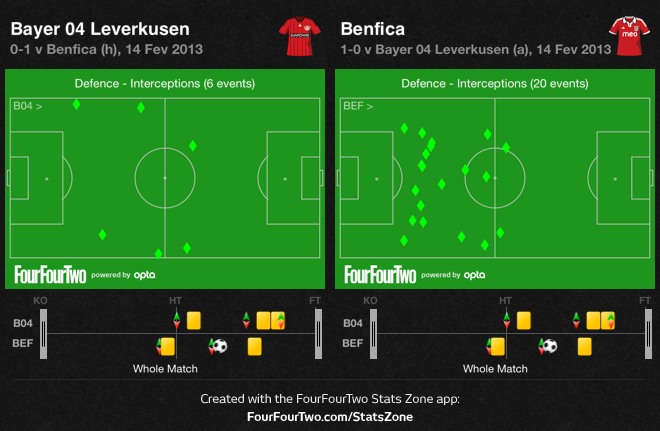 Notice how Bayer Leverkusen's interceptions are very near the touch line. On the other hand, Benfica's chalkboard provides a very interesting reading. Instead of going for the jugular, as they so often do, the Eagles dropped back and were happy to soak up pressure. If you look carefully at Benfica's chalkboard, you will see that only 2 of their 20 interceptions were made (just a tad) after the halfway line. Another interesting aspect of yesterday's match was the fluidity of Bayer Leverkusen's 3 forwards - Stefan Kiessling, Gonzalo Castro and André Schürrle. Even though they all had nominal starting positions, their movement was constant and their interplay was worth noticing. Kiessling, for instance, was crucial by dropping back to collect the ball with his back to goal, allowing Schürrle to exploit the space Kiessling had just vacated. Kiessling and Castro's versatile displays. While the flow of the match was not exactly divided in two perfect halves, it still proves interesting to break down the data between first and second half. 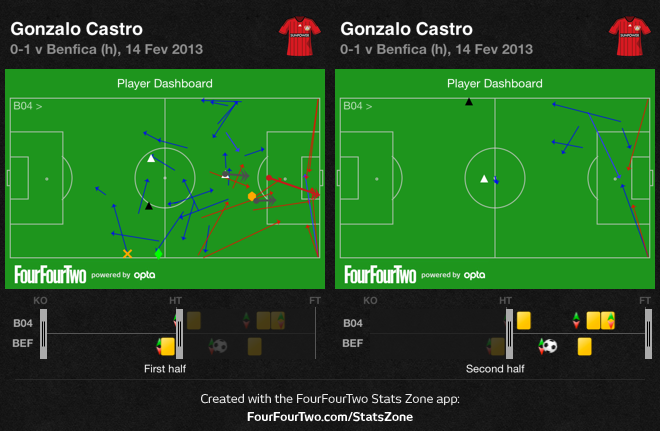 Let's begin with Castro's contrasting performances. Castro's dashboard divided in both halves. Castro was one of the most decisive players throughout the first half. Even though he started out on the right and remained there for the most part while defending, the right-winger would often drift centrally whenever his team had the ball. With this, not only did he create several numbers-up situations against Benfica's duo of Matic and André Gomes (similarly to what FC Porto's Defour did against Benfica), but he also freed the wing for Hogasai to venture forward. In the second half, however, his contribution was much more limited, partly because of Gaitán's higher defensive work rate. 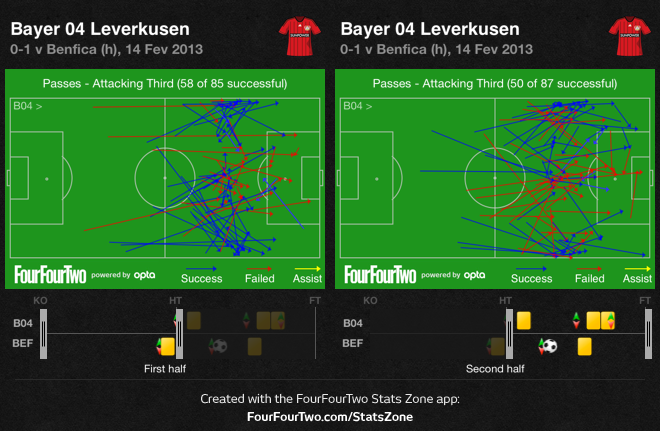 Bayer Leverkusen's passes in their attacking third - first half and second half. Thanks to the three forward's movement and guile, Bayer Leverkusen enjoyed large spells of possession and good positions to create danger from (even though they rarely got around to finishing the moves) during the first half. As you can see in the chalkboard above, not only did the German team insist on playing to the wings, but they also found it easy to penetrate down the centre and link up play. In the second half, their forays down the centre were much more speculative and their wing play was often frustrated by Benfica, as opposed to what happened in the first half. 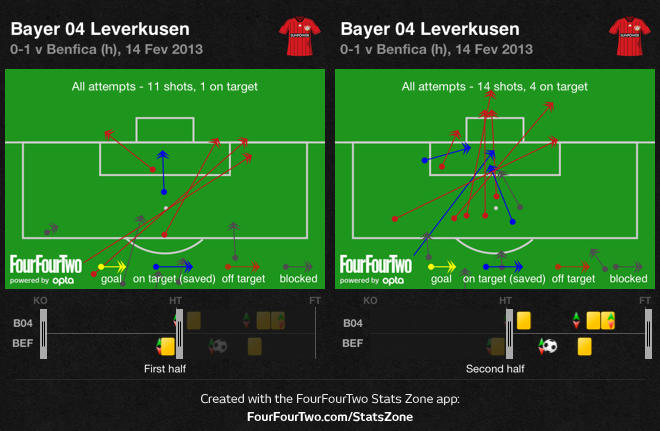 Bayer Leverkusen's shots - first half and second half. Although they benefited from a better run of play throughout the first period, the chalkboard above shows how Bayer Leverkusen were limited to long-range efforts for the most of the first 45 minutes. It was in the second half that they got closer to Artur Moraes' goal, at a time when they were getting more and more desperate to at least score a goal. Their best, most fluid play was no match for the more direct approach they favoured in the second half, particularly after going one goal down. Benfica's passes in their attacking third - first half and second half. As for Benfica, dividing their play between the two halves also provides interesting insight. By looking at the chalkboard above, you will see that the passes made in their attacking third were often lateral and that the central route hardly ever worked. However, there were still some attempts to knit a few short passes together. If you take a look at the second half's chalkboard, you will see that Benfica's passes are much more direct and incisive (hardly ever through the middle), typical for a team dedicated to counter-attacking. Benfica's shots - first half and second half. Even though there is no staggering difference between the first and second halves in terms of shots, it remains clear that not only did Benfica manage to shoot more, but they were also allowed to shoot from more favourable positions.